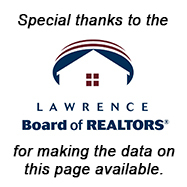 New home sales in the Lawrence Metropolitan Area totaled 7 units in February, down 36.4 percent from the same month in 2018. Year-to-date, 13 new homes have sold, down from 21 over the same period in 2018. The median price of new homes that sold in February was $334,900, compared to $369,900 in February 2018. New homes that sold in February were on the market an average of 71 days and sold for 99.9 percent of their asking prices.